TNR -- TV News and Reviews: Say Yes to the Dress -- "Clicking With Brides"
On tonight's episode of Say Yes to the Dress, "Clicking With Brides", Keasha scores the biggest win. The central theme of the episode was about how each Kleinfeld's consultant needs to bond as quickly as possible with a client, intuitively find the right dress for them according to their tastes, and act as advocate against any difficult family and friends. Keasha's bride Rychelle was a Canadian who'd been looking a long time for the perfect dress. She and her groom, a forrester, were to have an outdoor wedding near a lake. She wanted something simple and suitable for the outdoors, and perhaps a bit Bohemian. Keasha led her right away to dresses she thought would work. Rychelle was interested in one of the gowns, but said she thought perhaps it was a little too feminine for her. "Just try it on," Keasha urged. The moment Rychelle had the dress on, her face just lit up. The dress was gorgeous, with a dainty lace strap with dangling strands of lace over the shoulder. The skirt was flirty layers of antique lace in the shape of leaves and flowers, with pearl accents. It was beautiful and feminine. Rychelle, who was quite pretty, said she wasn't sure if it was too much, that she didn't know if she could pull it off, and that she wasn't used to drawing attention. This brought tears to her eyes, and it was sad to hear someone say they felt a dress was too pretty for them. Keasha encouraged her, and when she came out to show her mom, aunt, cousin, and sis-in-law, it was obvious this dress was the one. Her mother started crying on the spot, and Rychelle was extremely happy that she'd found the dress. Rychelle was astounded that Keasha had pulled one dress and it was the dress. She said it was the perfect relationship, because she was laid-back and so was Keasha, and they just seemed to understand each other right away. I'm happy that Rychelle was able to Say Yes to such a beautiful dress. She deserved to be as pretty as she wanted to be. Unfortunately, the other brides didn't fare so well. Susan, a 50-year-old woman getting married after 20 years of courtship, nearly broke my heart. Telling Kleinfeld consultant Audrey that she had to go more conservative because of her age, she was astounded when Audrey put her in an off-the shoulder shapely white satin dress with a moderately plunging neckline. Susan's face lit up, and she was so excited by it, and pleased that she still had some va-va-voom that she didn't realize she had. "I've been a mom for so long," she said. She came out to show the dress to her daughter and friend, and of course, both of them hated it. The daughter was extremely displeased, and it was obvious she was appalled that her mother would consider something low-cut. The dress was still simple and elegant, and did not reveal too much cleavage in my opinion. The daughter insisted, though, that her mother wouldn't really want to wear that for a "family" wedding. So compeltely crestfallen, Susan tried on another dress. The straight across neckline made her instantly look more matronly, and you could see on her fact that she didn't like it as much as the other dress. Decorated with lace, with lace straps, the dress fit her well and had a flattering hourglass style to it. It was, however, definitely more of a "mom" dress. She was unhappy, but her daughter and friend now approved of her non-sexiness, and so that was the dress Susan chose. I found it very odd that the consultants, who talk so extensively about making the bride happy, now said that it was better to make everyone else happy. Personally, I thought the whole thing was very upsetting. The dress was not risque at all, and I felt it was an example of ageism. It seemed the daughter and friend were threatened by Susan's happiness in the sexier dress, and were much happier when she was more sedate and less confident. After waiting 20 years for her wedding, I don't think Susan should have had to compromise on her own wedding gown, particularly when it wasn't inappropriate at all. The third bride on Say Yes to the Dress was 27 year old Leah. Her mother wasn't able to make the appointment, so she brought her best friend and cousin instead. The problem was that the best friend and bride had completely opposing viewpoints. The best friend chose a strapless gown that was a bit more edgy, with a lace-up back, horizontal pleating, and a big ruffled bottom. The bride didn't like it at all, which upset the friend. Dianne, the Kleinfeld consultant, tried to smooth things over by putting Leah into a different dress. This was a more sedate, simple strapless lace dress. Leah said she discovered she actually preferred a more traditional dress than she'd thought she would. But of course, the best friend then hated it. Leah started to regret not having brought her mother, because she knew her mom would have had the reassuring positive reaction that she needed. Determined not to lose out, Dianne tried another gown that she thought might be the best of both worlds, which it turned out to be. Form-fitting and strapless, the dress was fairly plain until a large below the knee skirt made of layers of tulle. The bride and friend and cousin all loved this new gown, but then Leah felt torn between this one and the lace dress. Dianne thought to solve this by bringing more gowns, but Leah decided she was too overwhelmed and couldn't make the decision without her mother. The Say Yes to the Dress voiceover let us know that she eventually found her dress at another store, with her mother and not her best friend. I'm wondering why she didn't return to Kleinfeld's when she was so in love with two of the dresses, but perhaps she felt too much sales pressure. 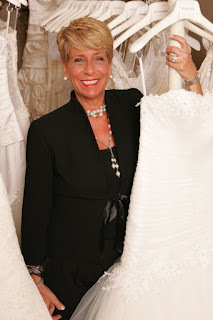 Kleinfeld consultants are, for the most part, all about the sale. PHOTOS: Kleinfeld consultants Keasha, Audrey, and Dianne, Say Yes to the Dress, c2009 TLC/Todd Pitt. Do you know the designer of Rychelle's dress? I would like to find Rychelle's dress. I have looked everywhere for something like hers. Any details on her dress would be helpful. I saw the epidsode once and haven't been able to find the video on the internet. Please help me find this dress or any details on it. I completely agree with you on Susan. Totally goes against their whole what "makes the bride happy is best" theory and suggests some ageism on their part. But really, she's only 50! (I'm saying this as a 20 year old). I thought she had an amazing body and rocked that dress. She should've gone with her heart and I'm irritated that they were so negative.